Successfully Added Touchscreen Media Cell Phone - Unlocked Dual-SIM Black Beauty to your Shopping Cart. Touchscreen cell phone with two SIM card slots. This smartly designed music media mobile phone has four speakers and an easy to use color icon menu system for getting your calling and media tasks done quickly. Media features on this model include; MP3 and MP4 players with beautiful stereo sound, a digital camera, image viewer, and FM radio. This touchscreen media cellphone also includes Alarm Clock and Task Manager/To-Do software with well designed extras that will turn these infrequently used tools into your new best friends! This media mobilephone is native dual band GSM/GPRS and has two SIM slots, allowing you to have two active phone numbers in the same phone. The phone has both call waiting and call divert options for the each SIM card. If you need need a simple way to describe this phone to your customers, we would suggest you can call this unit an easy to use dual-SIM touchscreen media cell phone for the college student or young professional. This next generation mobile phone proudly brought to you by Chinavasion Electronics. Order your stock now and don't forget to sell your customers additional add-on accessories like belt clip cases, protective sleeves, and Bluetooth earpieces to maximize your profits. 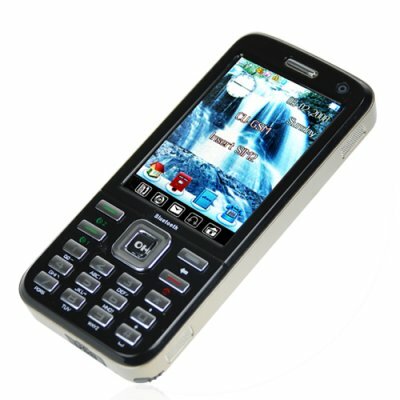 Touchscreen dual SIM media cell phone with easy to use dialing keypad. Media mobile phone with stereo surround speakers and advanced MP3/MP4 players. Phone features a clear polarized 2.5 inch LCD screen and colorful display. Task and to-do manager with time management and preset categories like meeting, anniversary, date, class, etc. Please inform alson on this items as soon as possible it is avialable on your store. Muy bonito tiene todo lo que quiero en teléfono móvil. Great phone and at least I can charge the battery using my computer. The charger sent with the device is useless as there is no way I can find to connect to it? The manual is vague in a lot of parts with no pictures to help guide you. Surprisingly it does work with my carrier, Tmobile, in the United States. I was planning on selling it on Ebay but I think I will keep it for now.